Clockwise from left: Mike Lindgren, Russ Allen, Steve Kordik, Scott Post, Gil Chesbro, Joe Palazzolo, Jerry Serviss, Alan Graham, Wes Groot (Ralph Brendler not pictured). Borrowing a great idea from Ron Harper's Hoosier Galoots get-together, this year we did a couple of hands-on workshops: One on making moldings with hollows and rounds, and another on basic geometric marquetry. After a brief presentation on tools and techniques, everyone had a chance to try their hands at it. 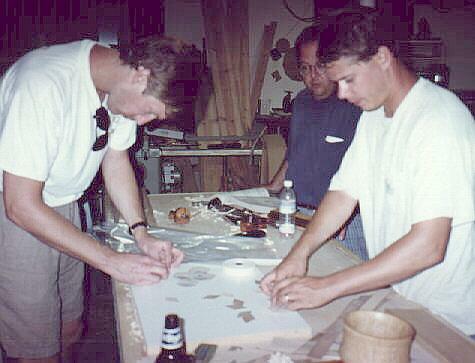 Wes Groot, Scott Post, and Joe Palazzolo tape up a couple marquetry pieces. Also during the evening, we continued the time-honored tradition of galoot show and tell. Everyone brought an interesting piece or two to pass around: Everything from the world's weirdest dovetail plane (courtesy of Alan Graham) to some oddball Yankee stuff (from Jerry Serviss, of course) to the mother of all marking gages, my own 24" long, 4 lb. "gagezilla". Scott Post put IT through IT's paces. Highlight of show and tell, however, was the "saw-off" between the now venerable IT saw and a soon-to-be-released competitor from a Canadian company. Dovetails and tenons were everywhere... Some might even say we got carried away in the comparisons. 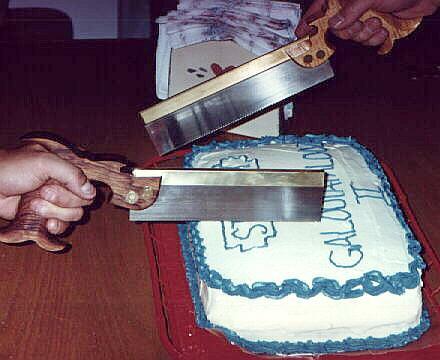 We determined that IT needs a coarser set to handle the really tough icing. Sunday morning brought the joint MWTCA/EAIA meet at Garfield Farm in La Fox, IL, west of Chicago. 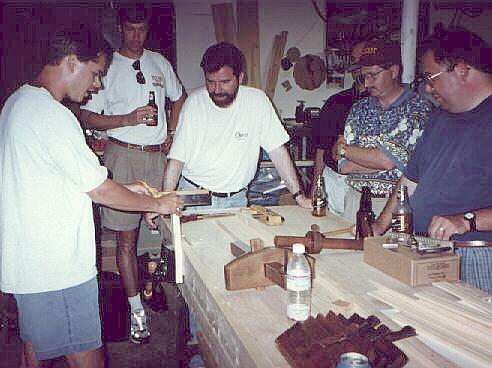 This was a big meet, so there was lots of fine tools to choose from. I think every Galoot went home with at least one thing they were looking for, and a few really hit the jackpot. 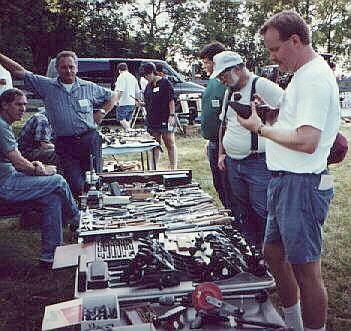 Jerry Serviss checks out a spiffy #4-1/2 at a dealer table. In short, a great time was had by all. I'm really looking forward to next year.